I know it's been awhile since I've last updated on our house. 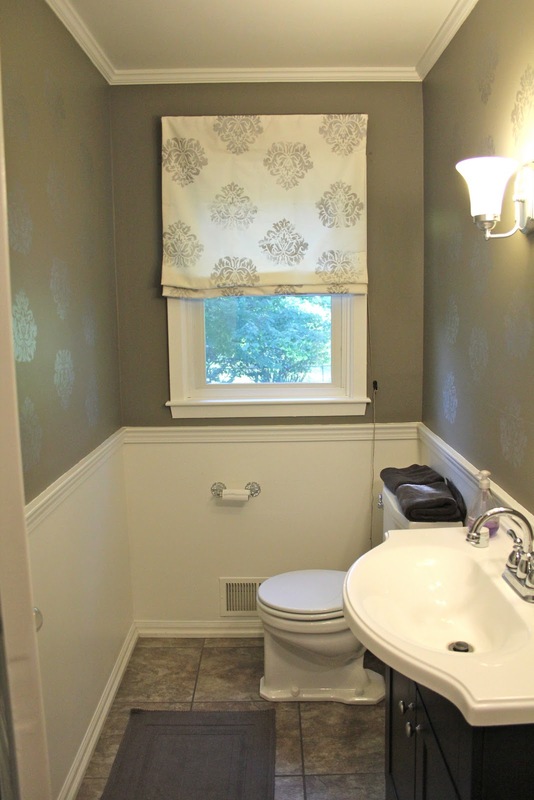 So it's high time I post about our half bathroom on our main level. Here is the before picture in all it's glory! Gold everything, mini blinds, outdated window treatments, wooden toilet seat and mirrorless. Got to love the scalloped sink with the crystal acorn handles. My sis-in-law, Emily, actually had a dream about them they were so bad! And now here's what it looks like now after we got a hold of it. We painted everything including spray painting the current hardware & light fixtures. 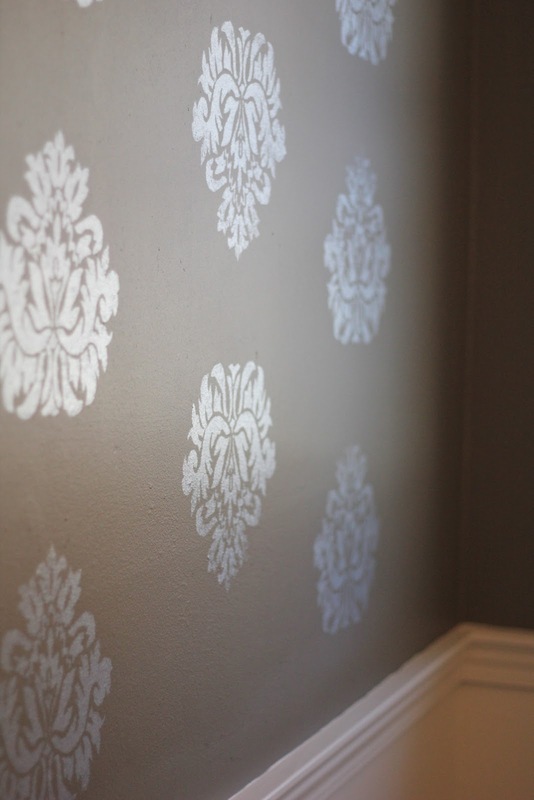 And my oh-so-talented MIL & SIL, Susan & Sally, helped by screen printing directing on our walls to spice it up. I absolutely love it!! I love that it has a little sparkle to it. 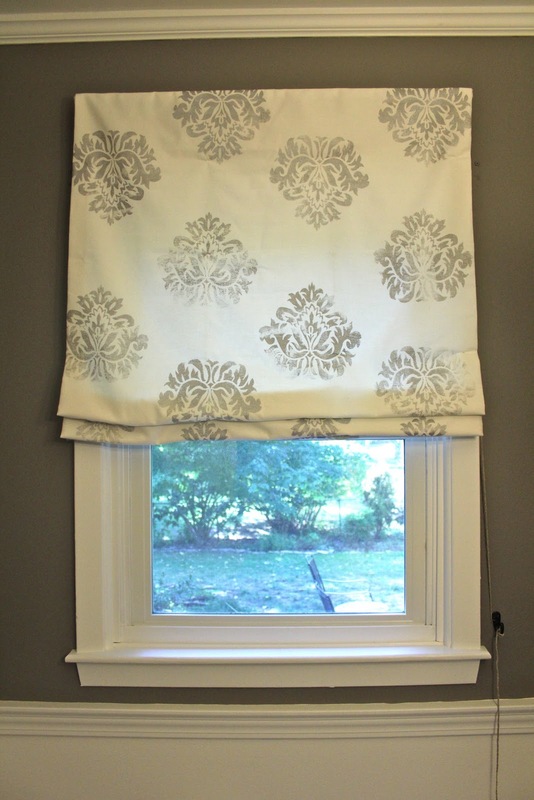 We ripped down the old window treatment and again my in-laws came to the rescue by making our very own custom roman shade. I love that it repeats the screen pattern so that it carries it to that wall. 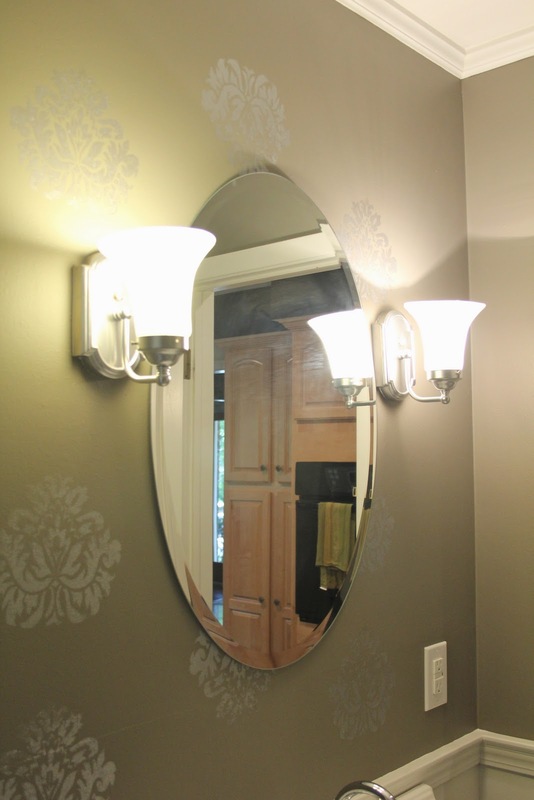 The new mirror and freshly spray painted light fixtures. Whenever I'm near a faucet KC comes running because his favorite thing is to drink out of them. In the picture above he's yelling at me to turn on the water for him. Ha! I actually think it worked out for the better. 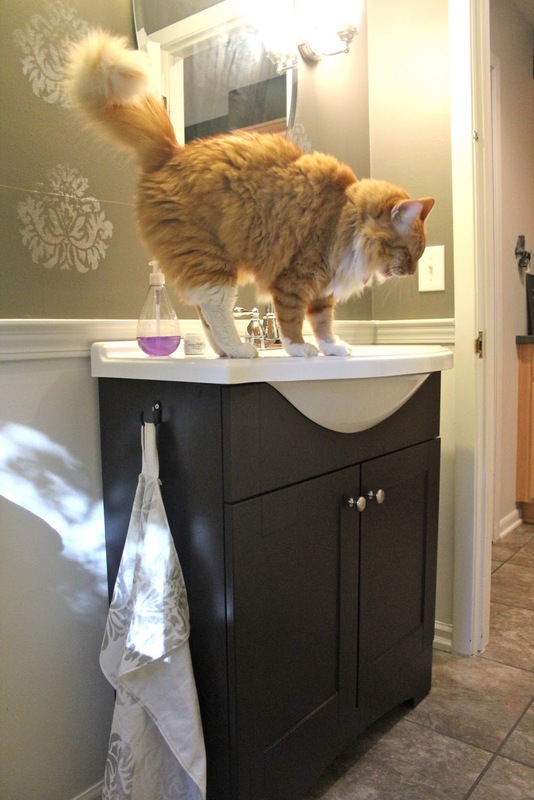 We decided against the pedestals sinks and went with what's pictured above. I like that we have a little bit of storage now. 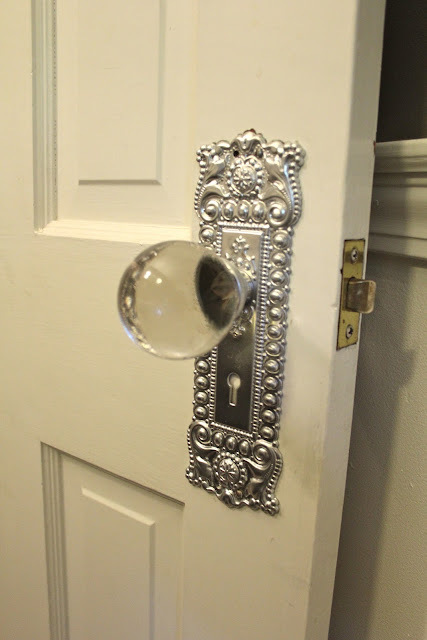 One of my favorite features about this bathroom is the door knob. 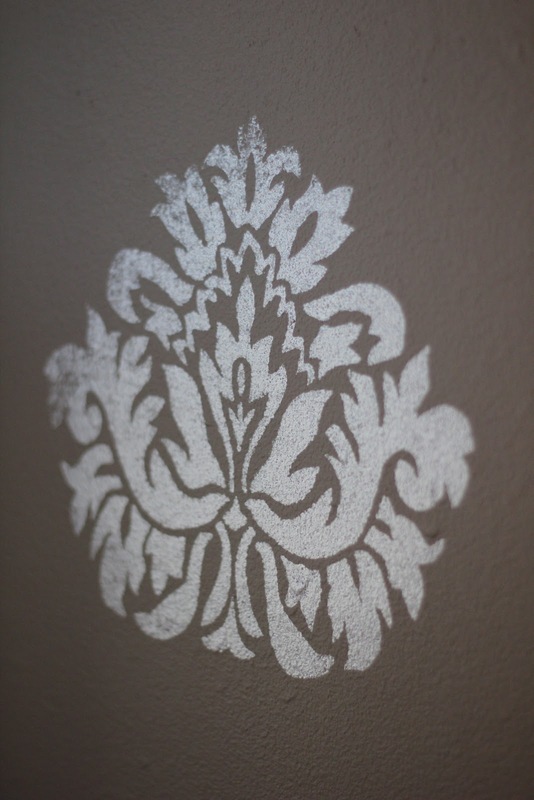 It was gold before we spray painted it and I still LOVE it. I'm a dork like that. 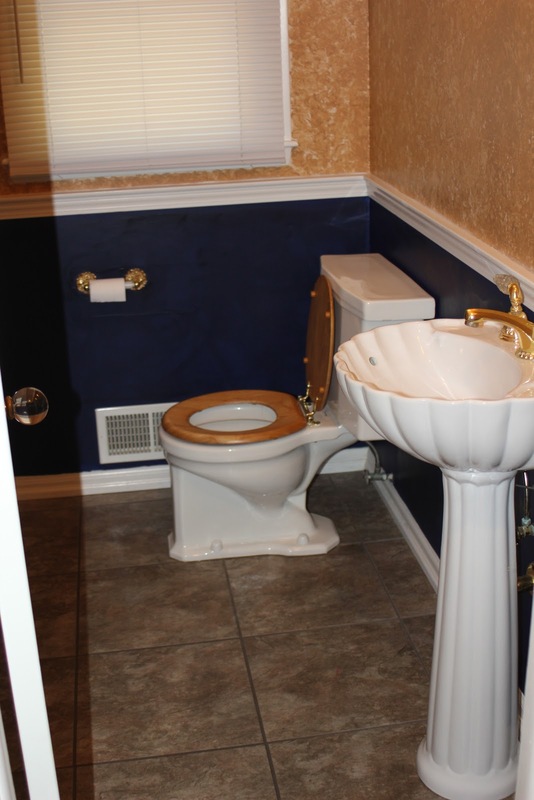 We still would like to hang things on the wall and possibly a shelf above the toilet. I'm just not sure what to put yet. But we are almost there! I love it!! The colors are great and you all did a fantastic job! 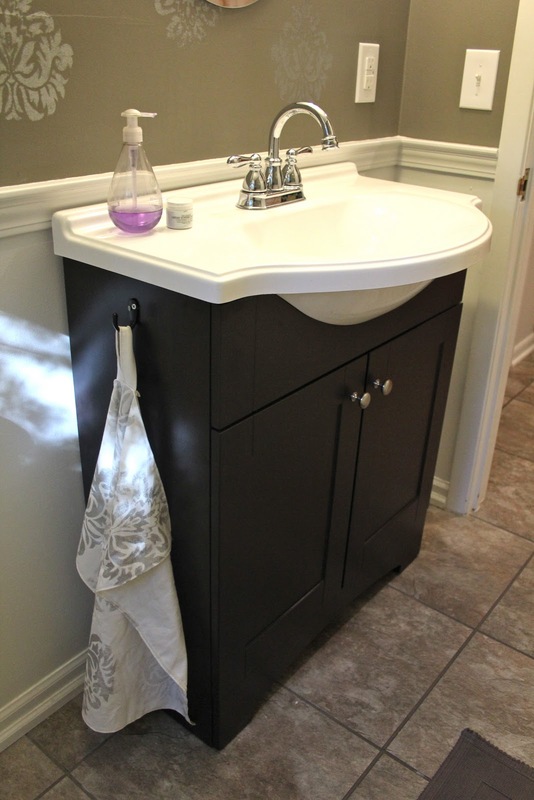 we have that same sink :) LOVE LOVE LOVE the screen print and the doorknob! Well done! 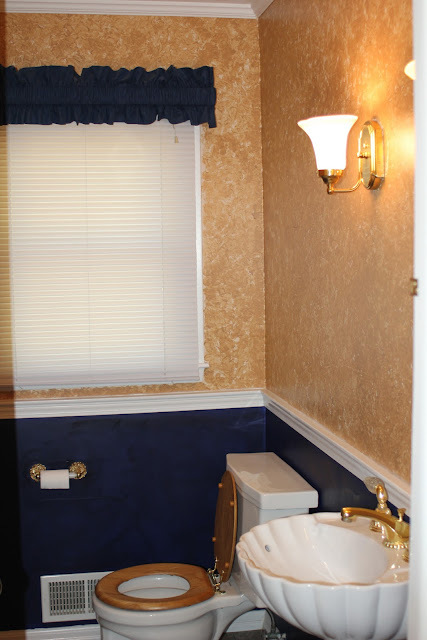 I am super impressed that you were able to create such a gorgeous bathroom by painting over the gold and adding some cool personal touches. Verrry nice! LOVE it!! I don't understand why you didn't keep the shell pedestal sink...lol! It turned out so great!